Starting from May 7th 2018, DP470 Series will be discontinued. As a upgrade substitute, please check out the DPPT Series or DP600A Series Panel Meter for details. The DP470 Series of single- and six-channel digital temperature and process measurement indicators set a new standard for performance, features, value and reliability. With built-in easy digital programmability, communications and powerful Windows-based software, the DP470 is ideal for monitoring, testing and process control applications. Complete configuration of the instrument can be quickly performed from the front panel, including designating sensor input type, sampling rate, limit settings and resolution. Process and min/max values can be selected for display from the front panel. The DP470 is the first of the new generation of "intelligent" panel-mounted digital temperature and process measurement indicators, offering scanning and datalogging features at a low price. With its built-in functionality, digital communications and powerful PC-based software, the economical DP470 is the instrument of choice for a wide range of monitoring, recording and logging applications. 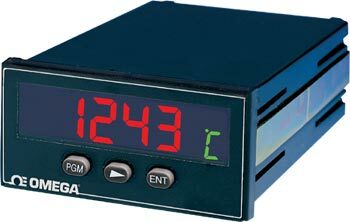 The standard single-input model features easy-to-use front panel configuration and display of temperature or process measurement with either 0.1 or 1 resolution, min/max values and limit conditions. 참고: Free software is included with unit. PROTOCOL not available for this series.